Now that real baseball has finally started, we are very likely going to spend a lot more time here at FanGraphs discussing the game on the field. That’s a very good thing for all of us who love the sport. 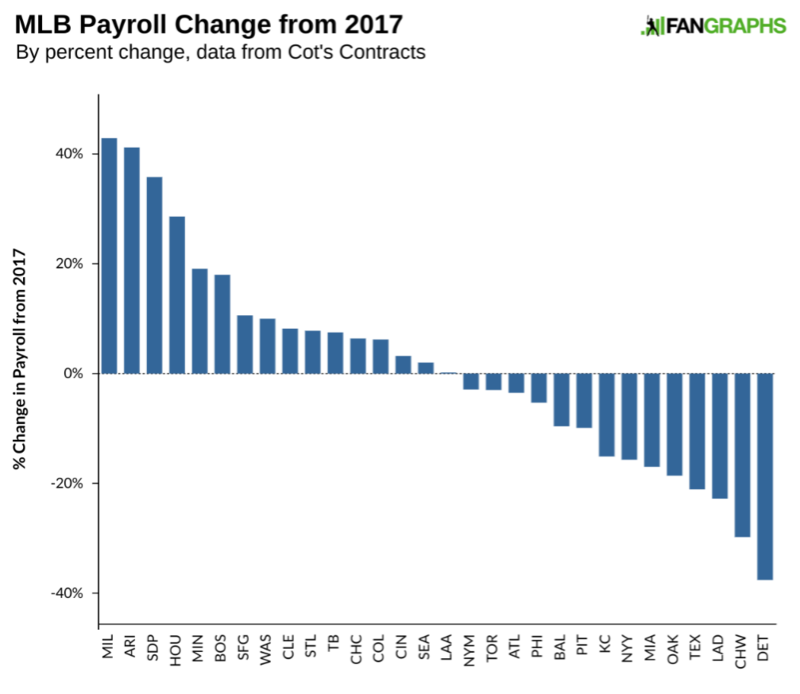 Before wading too deeply into the new season, however, let’s take one more look at how this offseason affected payrolls. This past winter was an unusual one, with a number of free agents receiving significantly less than expected, and players and teams holding out for contracts all the way until the season’s start. Most of our pieces contained a general caveat that we would need to wait until all players had signed to really determine the effects of this offseason. I even spent some time wondering if we would have to wait until after next offseason to determine the longer-term effects of this past winter. As we have now reached Opening Day, we have the opportunity to look at current payrolls and compare them to the same point last year. Here’s where we sit on Opening Day, per Cot’s Contracts. The Boston Red Sox are well out in front of all teams, followed by the San Francisco Giants, Los Angeles Dodgers, Chicago Cubs, and Washington Nationals. Notable by their omission, the New York Yankees don’t appear among the top five. This is notable for several reasons. The Yankees haven’t placed outside the top three in MLB payroll since 1992, the year Marlins owner Derek Jeter was drafted. Melido Perez and Danny Tartabull were the team’s top-two players. The last time the franchise had an Opening Day payroll lower than $167 million before this season was 2003, before Alex Rodriguez had ever played a game for the club. For the most part, we see all the big markets at the top and the small markets at the bottom. That looks fairly normal. Now, let’s compare these figures to those from the same point last year. Here are the gains and drops by percentage. The graph above makes it appear as though payroll might be increasing this season. Appearances can be deceiving, and that is certainly the case here. The average of all the teams seen above shows an increase of 1.2%; however, payroll has not increased. It has actually decreased. The top-five teams with increases had an average payroll of $92 million last season. Meanwhile, the bottom-five teams had an average payroll of $157 million. An average percentage distorts the actual gains and losses. Here’s a graph showing the change in dollar numbers as opposed to a percentage. 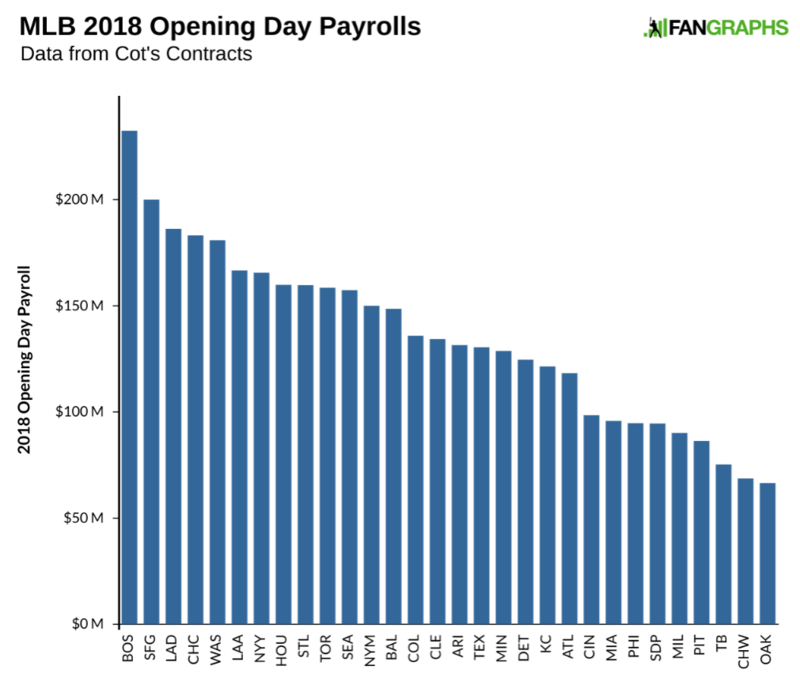 This graph illustrates the impact of the payroll shed this offseason by big-market teams. The Detroit Tigers aren’t necessarily a big-market team, but they had large payrolls for many years. As they enter a rebuild, they have lowered salaries massively. The team’s $75 million drop is larger than the team’s entire payroll in 2005. It is larger than the current payrolls of both the White Sox and the A’s. To provide a little more nuance to the graphs presented here, let’s sort every club into one of three groups. First, teams with increased payrolls. All of these clubs — with the exception of the San Diego Padres — could be called win-now teams. The Astros, Brewers, Diamondbacks, and Twins all experienced varying degrees of success in 2017, from the almost-playoffs Brewers to the World Champion Houston Astros. These teams are clearly trying to capitalize on their success from last season and either to maintain that level or improve upon it. The Brewers and Twins were two of the most aggressive teams this offseason, while the Astros and Diamondbacks had a lot of players receive raises. Houston, of course, also added Justin Verlander in the middle of last season. The Red Sox stayed under the competitive balance tax last season so had no problems going over this year to sign J.D. Martinez. The Giants and Nationals are perhaps the ultimate win-now clubs. The former has an aging core, while the latter has multiple pending free agents including superstar Bryce Harper. Here are the teams that maintained the status quo from last season, staying within 10% of the prior year’s payroll. Nearly half of teams have kept payroll within arm’s reach of last year’s Opening Day mark. The Cardinals were closer to the bottom of this list before adding Greg Holland. Teams like the Rockies and Phillies were pretty aggressive this offseason, but essentially added back payroll that just came off he books. The Mets were fairly aggressive, as well, and still managed to lower payroll. Even after the team added Alex Cobb, the Orioles still saw a decent drop-off form last year’s payroll. The Pirates made significant moves to reduce payroll this season in the hopes of contending in the future at the expense of this season. The Angels made a lot of moves this offseason, but Shohei Ohtani cost them almost nothing, while Zack Cozart and Ian Kinsler simply replace Josh Hamilton’s salary. The Blue Jays are trying to compete, but managed to avoid any large deal should they decide to rebuild starting next year. Here are the teams with the biggest reductions in payroll. The Marlins, Royals, Tigers, and White Sox are still in some phase of rebuilding. Oakland is doing Oakland-type things. The Dodgers’ and Yankees’ intent to avoid the competitive-balance tax is clear. The Rangers very quietly did little/nothing to improve their team over the winter. Overall, we see a decrease from last season of roughly $56 million, a 1.3% drop. That amount is essentially equal to the Dodgers’ dip from last year. Even if only the Dodgers, Rangers, and Yankees spent what they did last year, we’d see an increase of about 1.5%. If we added in the Tigers to that group, we’d see an increase of close to 5%, basically what was expected. There are a large number of factors slowing down payroll and causing the fall in free-agent pricing. If some teams in the middle were a bit more aggressive, we might have had a typical offseason in terms of spending. The qualifying offer might have had some effect on the offers to players. It’s pretty easy to point a finger at the competitive-balance tax when typical spending by the Dodgers and Yankees would have meant an increase in payroll over previous years. Maybe some of the gap will be made up next season. There’s been considerable discussion over the player share of MLB revenues. If we give MLB the benefit of the doubt and assume the numbers provided to Ben Lindbergh are correct — numbers which, notably, don’t include money from the billion-dollar BAMTech or ownership interests in the television stations that play MLB games — players received around 50% of revenue last season. If MLB revenues increase about 5% to $9.5 billion and player salaries do not go up, the player share of revenue is going to drop down to 47%, a significant drop for the players. Even if we are generous with the MLB figures, the player share of revenue is going to be at its lowest in several decades. Okay. Back to Baseball. 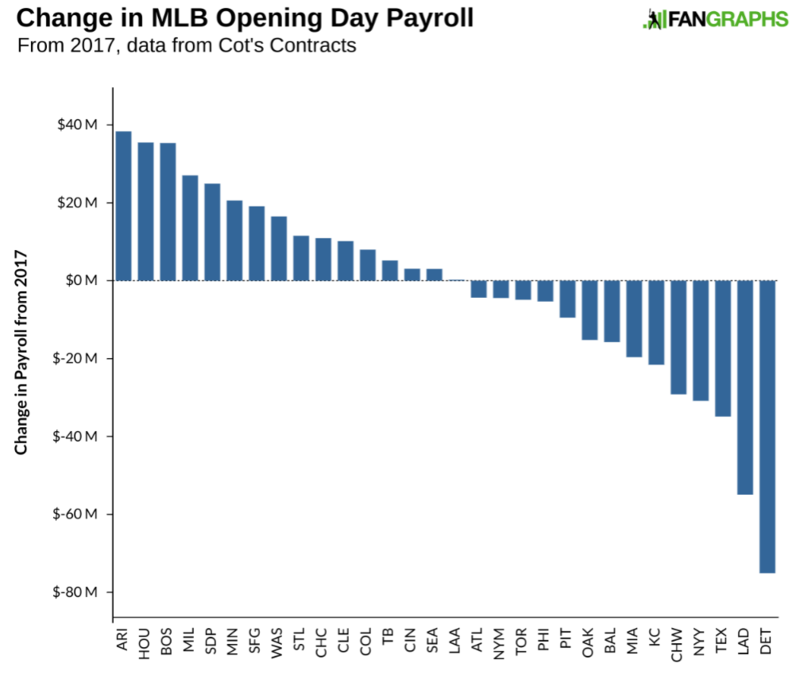 We hoped you liked reading MLB Opening Day Payrolls Down from 2017 by Craig Edwards! Numbers provided to Ben by MLB and -verified by the MLBPA as accurate-. I’m as big a supporter of more fair player compensation as anyone, but to just handwave the numbers Ben received as suspect because they came from MLB without noting that MLBPA verified their accuracy is misleading at best. It isn’t that they are suspect. They just don’t include figures that we know MLB owners receive, even if MLBPA agrees it isn’t “baseball revenue”. Mentioning the post and author where I got the information and linking to said post is hardly misleading. None of that changes that players are in for a significant downturn this season. The phrase ‘benefit of the doubt’ implies you view the numbers as suspect; rather, it would make more sense to point out that MLBPA agrees that this is the distribution, and has surely screwed up catastrophically by not getting any BAMTech or RSN revenue included in ‘baseball revenues’. The opposing party has verified the numbers are accurate; there’s no benefit of the doubt required. What is required is better advocacy by the players association to tap into the revenues not included in those figures. The entire phrasing of that paragraph carries the implication that MLB is potentially withholding information or presenting misleading information about the players’ share of revenues. How can you construe BAMTech as baseball revenue if the MLBPA doesn’t? Craig it sounds like you are veering into the realm of Mega Agents talking points. I think the focus should be more on the several billion dollars extra owners receive for owning a baseball team rather than how we classify that revenue . Arguing over how to classify it also distracts from the fact that simply using MLBs numbers means players are going to fall about $300 millino short of a 50/50 split even before arguing about BAMTech and owning sports networks. Yes but were also using the MLBPAs numbers because they agreed to exclude that revenue via very bad collective bargaining. This isnt a case of the owners sneaking some loophole in the rule to screw their players. It’s a case of the players agreeing to be screwed. MLBPA is partially culpable for their own predicament. You absolve them of this responsibility by excluding it. Why should MLBPA be entitled to a share of BAMTech profits? MLB took the risk of investing in it and building it into a sellable asset including broadcasting non-baseball events through this over-the-top medium. It probably lost money its first few years. If MLBPA had invested alongside and lost money with MLB, they’d have a claim. Otherwise not, since none of the previous CBA’s would have stipulated a claim on revenue sources not yet imagined let alone created. I mean, I’m sure that argument is why they didn’t. But you could make that same argument about team television contracts, and that money is baseball revenue. And the reason for that is that BAMtech doesn’t exist, and doesn’t become a profitable/sellable asset, without baseball players playing games that people want to watch. You’re looking at it through the prism of normal employment, where your employer pays you $X because you have a skillset and makes any amount of profit you provide above that, and if you think you’re underpaid, you can get promoted or move to a competitor. Baseball players A: have no competitor B: ARE the product and C: have a union to represent them. The other professional leagues have long since established a strong precedent for including all profit made from broadcasting the league as league revenues; there’s no reason MLBPA could not have pushed the same thing. Perhaps the split of BAMTech profits is not 50/50 since the owenrs bore some (fairly minor) initial risk, but the MLBPA certainly should have pushed for inclusion, because that product has no value without its members. BAMTech powers HBONow, WWE, NHL, Riot Games’ “League of Legends,” and now Disney and ESPN’s streaming services. Good of you to allow MLB a bit more than 50/50. BAMTech pays NHL $600M/yr over 6 years to power their web sites, streaming, etc. Its deal with MLB is structured similarly, I’m sure and is included in the $9.5B revenue line. Meanwhile, the average salary for an MLB player has gone up from $3.39M in 2014 to $3.84M in 2015, $4.38M in 2016, and $4.47M in 2017. The huge jumps from 2014 to 2015 and 2015 to 2016 likely a result of the additional licensing revenue from BAMTech. Oh, if only Tony Clark would stop making these “egregious mistakes” on behalf of these exploited workers! I guess he should de-incentivize the owners from making any innovations, one that even another professional sports league, the NHL, relies upon and has probably led to more money to NHL players too. It reads like you are conflating all of MLB Advanced Media with BAMTech. BAMTech specifically is MLBAM’s digital media arm that works with non-baseball clients/partners, mainly in providing streaming technology as Shalesh mentions (HBONow, WatchESPN, NHL, WWE, PGA Tour, etc.) After Disney’s latest acquisition of a stake in BAMTech, it’s 75% owned by Disney, 15% owned by MLBAM (i.e., MLB teams as a group) and about 10% owned by the NHL. The baseball-specific parts of MLBAM – MLB.tv, team websites, development of R.B.I. Baseball – are outside of BAMTech and still owned by MLB teams as a group. Those aren’t part of the operations of which Disney now owns a majority. The numbers used by Lindbergh are described as including “MLBAM Net Income”, so his revenue numbers should be picking up profits from the baseball-related MLBAM operations, and probably ongoing profits from MLBAM’s minority ownership stake in BAMTech. It’s almost certainly not picking up the one-time realized capital gains as Disney has purchased its controlling stake in BAMTech in two separate transactions in 2016 and 2017, as otherwise we wouldn’t see such smooth trends in the revenue numbers used by Lindbergh. So, yes, it’s eminently reasonable that net income from MLBAM’s operations related to baseball content are viewed as baseball-related revenue for teams, just like TV rights fees or the teams’ collective profits from the MLB Network. It’s tougher to make that argument for BAMTech specifically, however, as it’s more akin to a venture capital investment that worked out well and happened to be made by MLB team owners as a group. The really big numbers thrown around for BAMTech ($50 million per team) are also one-time gains as Disney has bought a majority stake in it, not recurring revenue for teams. How about a focus on how Arbitration fails to pay good young players equitably? Or recognizing that the youngest cohorts are producing more relative WAR in 2017 than during most of the period you are discussing? He answered your question thoroughly, and while you may not agree with the answer, changing the subject from a discussion about who deserves BAMtech revenue to arbitration exposes you as argumentative and potentially biased, rather than curious and open minded. Fine, that’s you. But why you’re getting upvoted for this, I have no idea. I think we should focus on the franchise’s revenue rather than the owners revenue. Once you start focusing on owners revenue you start running into what i classify as crummy arguments like you get with Bob Nutting’s ski resorts and news papers. Should Bob be using more of his profits from those businesses to fund more in the pirates? Should Bill Mahr be putting his HBO money to fund the Mets? (assuming he’s still an owner) where do you draw the line? I assume MLB’s numbers are right, considering even MLB’s opposition verified them and they probably used similar data in the past(?).. In which case there is no reason at all to doubt the information as near 50/50 keeping in line with previous years. Really sounds like a witch hunt with no witch. Giving the MLB the benefit of the doubt just means acknowledging that they have an incentive to juke the numbers, but we are going to trust their numbers anyways because we have no specific reason not to. Ben verified the numbers with MLBPA, the opposing party.